I haven't had much on the go musically for the last while. Between the Speakeasy Garage, and managing life's other tasks, I've been admittedly quiet. But, things are turning up Curtis; I've got songs in the cooker, shows being booked, and ambitions to follow through on. Stay posted! After dreaming for years of converting my garage into a full time creative space, I'm happy to report that I have finally finished it. The Speakeasy Garage is up and running. I'm happy to have been selected to perform in the finals of the Calgary Folk Festival songwriting competition. I'll be performing my tune "I Wish You Well" in the finals of the "Pros & Prose" category. The finals take place this year at Festival Hall on Sunday, May 17th. Come out and show your support, buy beers, give them to me, and we'll go from there. I am excited to be joining the ranks of invited Alberta artists in attending/performing at this years Folk Alliance International Conference & Music Camp. I'm pretty chuffed that Alberta Music has included a track of mine on their upcoming Livestock Music Sampler. It's all for the sake of promoting the great talent that this province has, so I'm pretty chuffed to be included. Click the photo above & check out the AB Music website for more details. I'm excited to be a part of Alberta Music's Acoustic Showcase Series at the Canadian Country Music Week this year in Edmonton. This will be webcast live for all to see & hear! I've put the webcast below for you to enjoy! We'll be o @ 2pm Friday Sep 5th! The fellas & I will be at Spaghetti Western Festival this year alongside some great Alberta talent. It's nice out, it's free, and it's going to be fun. Best be seeing you down there. The finale concert for the Acoustic Guitar Project was a blast! Thanks to Gallery House Concerts, National Music Centre & all the other artists in the project. Lots of show happening in the next two weeks. Check out the SHOWS page for the details! I am pleased to be involved with the Calgary Acoustic Guitar Project this summer! 10 songwriters were chosen in the city to participate; each songwriter gets one week with the project guitar, in this case a folding Voyage Air Fender acoustic, and has to write & record a song in one week before handing the guitar off to the next artist. There will be a CD compilation made and a finale concert with all the artists will be held at the National Music Centre on Sundau, Aug 12th @ 3pm. Shot this out at The Banff Centre during my musician residency there in the winter. Joined by pals Handsome Roan & Steve Dawson. I have been selected to perform in two great songwriting contest finals this year! I will be performing "Sink or Swim" in the South Country Fair Songwriting Contest finals in the "Old Pros" category. Finals take place Saturday May 3rd at The Slice in Lethbridge. Show goes at 7 bells. I also muscled my way into the Calgary Folk Festival Songwriting Competition finals in the "Pros & Prose" category with my song "Castaway". Performances for that category take place on Monday, May 19th at The Ship & Anchor around 2PM. If you're in the area, come out and support all the local talent in these contests! Come join Handsome Roan & I as we celebrate the launch of our EP, "Comin' Home". 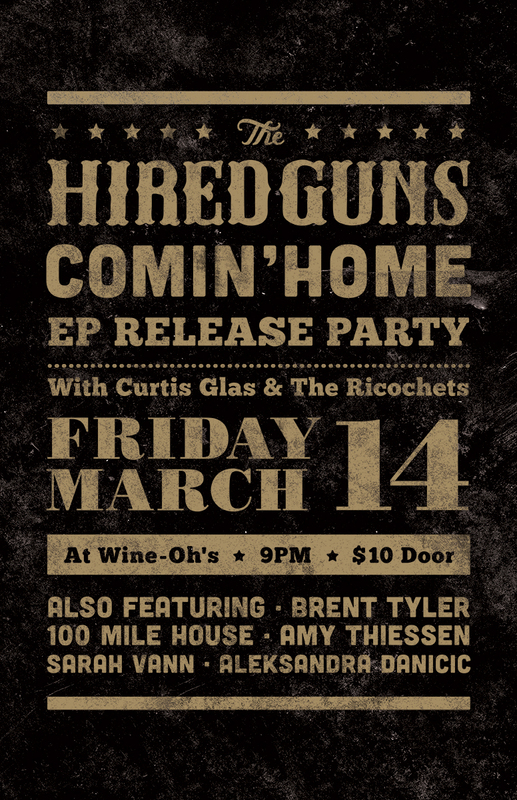 It's going to be a fun night, featuring guest appearances by Brent Tyler, Amy Thiessen, Sarah Vann & 100 Mile House. The night will also feature the official debut of Curtis Glas & The Ricochets. Don't miss it! Looking for more Curtis in your life? Who isn't. 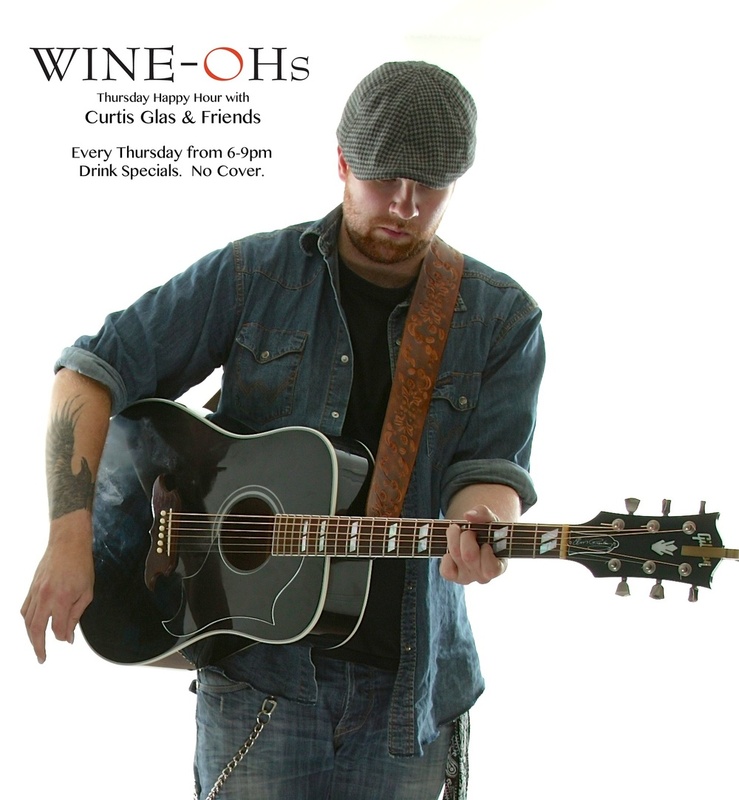 Get down to the Wine-Oh's cellar every Thursday where I'll be playing tunes for the happy hour (6-9ish). I'll have a rotating cast of friends join me to keep it fresh, so come on down and take a load off. It's been a great year of shows, recording, growing, changing, messing up & moving on. Thanks to you for being a part of the journey. Stick around for next year; there'll be even more exciting things to come! Have a very Merry Christmas and a prosperous New Year. Well, The Banff Centre has just about everything a feller could want and more. Including a sweet concert hall, high definition cameras, and wonderful guest musicians. I decided to get my hands on all the above and shoot a little video for everyone to enjoy. Hi folks! I'm packing up the van and headed west for a two week musician residence at The Banff Centre. I'm pretty honoured to be working with the other artists out there (Amy Thiessen, Steve Dawson, Whitehorse, just to name a few). Hoping to grasp onto fleeting moments of creativity & determination. Looking to come back home with a few more tunes in my pocket for y'all. See you in December!